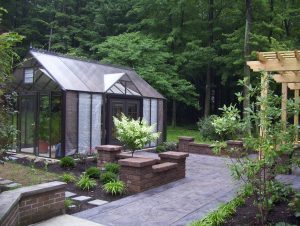 A lot of people think that once they purchase a greenhouse they are done. They mistakenly think it will function completely on its own, but this could not be further from the truth. It is important to buy a greenhouse structure that fits your needs. 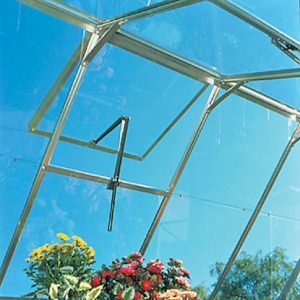 But, it is equally as important to purchase and install the proper greenhouse accessories & supplies. Some of the items are necessary for greenhouse gardening while some of them are optional and depend on what you are growing and your budget. If you intend to keep your greenhouse above the temperature outside a heater is a necessity. The greenhouse itself will not maintain any of the heat it has built up during the day unless you are using solar heating practices. Greenhouse heaters can be electric, natural gas or propane. These consist of a motorized fan, motorized intake shutter and a thermostat. The fan and intake shutter are wired to the thermostat which allows them to activate at the same time. This creates good air flow throughout the greenhouse which helps eliminate layers of air that are too warm or too cold. Most greenhouses have roof vents. They are an excellent way to help cool a greenhouse because they vent hot air out through the roof. The vents can be manual or automatic. An automatic watering system is a favorite among busy greenhouse growers, as it ensures the plants and seedlings receive the proper amount of water. Automatic watering systems can utilize timers to water once, twice a day, or even several times a day depending on what the plants need. Most people think of this as an option, but I consider it a necessity. Most people use benches in their greenhouse. There are a lot of different styles including wood, aluminum and fiberglass. You probably will not want to use a wood bench unless it is cedar, as the high humidity of the greenhouse will cause them to rot over time. Benches can be easily added to a greenhouse at any time and should be considered optional at the time of purchase. Shade cloth is an inexpensive way of controlling the heat inside a greenhouse. It is typically installed only on the roof, but some growers will also install it on the sidewalls. Shade cloth can be installed on the outside or inside of a greenhouse, but it is more effective if it is installed on the outside. It is available in many different percentages that vary from blocking part of the sun up to almost all of it. This is a nice accessory to have but is optional because it can be easily added at any time. These are a really important accessory if you are starting seeds, protecting seedlings, or simply trying to cut down on the heat needed to keep the greenhouse warm. The mats will warm the soil and increase germination rate. They are a very valuable tool for a greenhouse but certainly optional. Don’t fall into the trap of thinking a greenhouse is the only thing needed for healthy and happy plants. Make sure it is accessorized correctly in the beginning and it will provide a more enjoyable growing experience and a better environment for the plants.